xFine gives you the ability to visualize small lesions down to 2 mm. So you have the information you need to make clinically relevant decisions. Smaller image voxels can have a significant impact on clinical decisions. ×Fine is a 2 mm whole-body clinical reconstruction protocol offering superb spatial resolution. It helps you draw regions of interest around small structures with increased confidence. 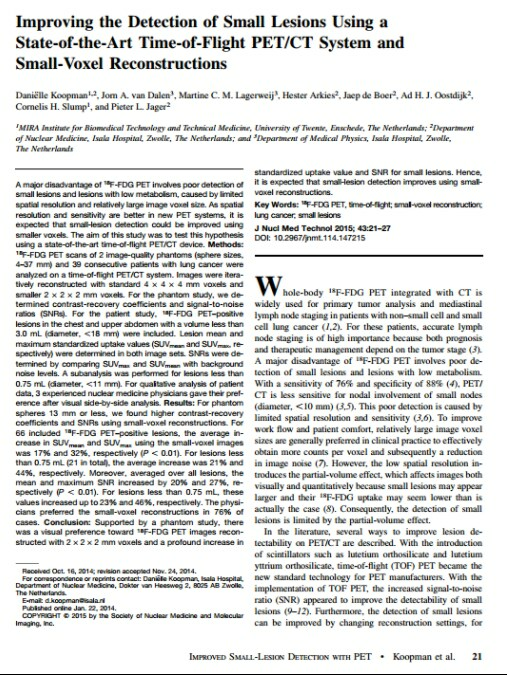 The smaller voxels reduce partial-volume effects, resulting in enhanced quantification accuracy and lesion detectability. These whole-body scans were reconstructed from the same data using a 4 mm voxel size (left), ×Fine (center), and ×Fine plus ×Sharp (right). The improved detail can be seen with ×Fine plus xSharp. In a recent paper, specialists reported a case study of a 68-year-old woman with lung cancer, being investigated for possible metastases in the adrenal gland. On the image reconstructed using 4 mm voxels, there was no enlargement of the gland on CT, and there was a slightly increased FDG uptake. This led the clinicians to consider the gland to be benign. On a retrospective image reconstruction using 2 mm voxels, there was a higher SUVmax and a higher contrast (despite increased noise). The gland appeared suspicious and more likely to be metastatic. A follow-up PET/CT scan two months later revealed an even higher SUVmax and an enlarged right adrenal gland. Experts at Isala Hospital have adopted image reconstruction using 2 mm voxels as standard. Tune in to the video to find out why. Want to learn more about how research and clinical routines can benefit from xFine and the entire xPand5 technology suite? Discover the value 2 mm reconstruction with ×Fine brings to Isala Hospital in the Netherlands. To find out more and gain answers to your open questions, please get in touch.